In this blog i will provide you the details of VMware virtual machine hardware versions with VMware product. Virtual Machine will not power on with virtual hardware version that is high than the VMware product supports. Virtual Machine with hardware version lower than the VMware product can be powered on, but functionality may be lost. Lost functionality results in menu items related to virtual machine operations being grayed out and unavailable. Virtual Machine’s hardware version can be sowngraded only by Workstation 6.x or later, Converter 3.x or later and Fusion 2.x or later. 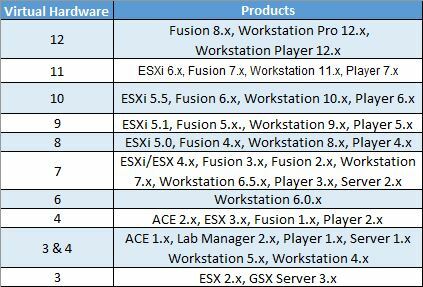 Any VMware Product in the chart above, with exception VMware player, is able to upgrade the version of a Virtual machine’s hardware to the highest version that product support. Hope you find this useful. Thanks for reading.